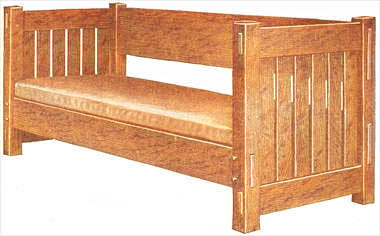 A unique piece of furniture, this settee will add lots of character to a mission-style room. Click here for detailed mission sette plans. Should be made of quarter-sawed white oak. 4 posts, 3-1/4 by 3-1/4 by 36-1/2 in., S-4-S.
4 end rails, 1-1/2 by 5 by 32 in., S-4-S.
12 end slats, 5/8 by 3-1/2 by 24 in., S-4-S.
1 front rail, 1-1/2 by 7 by 87 in., S-4-S.
1 lower back rail, 1-1/2 by 9 by 87 in., S-4-S.
1 upper back rail, 1-1/2 by 12 by 87 in., S-4-S.
2 cleats for seat frame, 1-1/2 by 2 by 82 in., S-4-S.
2 cleats for seat frame, 1-1/2 by 2 by 32 in., S-4-S.
On account of the unusual width of the pieces that go into the makeup of this settee, it will be necessary to have the wood thoroughly seasoned before putting them together, otherwise shrinkage will cause them to crack open. Begin work by making the ends of the settee first. Cut the posts to length, chamfering both top and bottoms somewhat so that they shall not splinter or cause injury to the hands. Next lay out and cut the mortises as shown on the drawing. With the posts finished, lay out the end rails, cutting the tenons and the mortises into which the ends of the slats are to be fitted. It should be noted that the drawing calls for the "setting in" of the whole of the ends of the slats, there being no shoulders. This is much easier and gives just as satisfactory a result, provided the sides of the mortises are carefully cut. Thoroughly scrape and sandpaper all these parts and then put the ends together. In addition to the glue it will be well to through pin each of the tenons and mortises. These pins may be put in flush and permanent on the ends of the settee. On the side rails, however, the pins are to be allowed to project so that they can be removed, and no glue is used in the joint. While the glue of the ends is hardening, prepare the rails of front and back. Scrape and sandpaper these and when the clamps can be removed from the ends put the whole frame together. The ends of all projecting tenons are chamfered. The illustration shows a loose leather cushion. There is quite a variety of materials out of which such a cushion can be made. The best, of course, is leather. In the highest class of furniture where loose cushions are used, the seat base is formed by solidly mortising a frame together on which is woven a heavy cane seating. This in turn is fastened to the inside of the piece of furniture, and the cushions when placed upon it make a very comfortable seat. The stock bill for this settee calls for such a frame. Wood slats may be substituted if desired. This piece of furniture will look well if finished in weathered oak. See that all glue is removed from the surface, and that the wood is clean and smooth, and apply a coat of weathered oak oil stain. Sandpaper this lightly with No. 00 paper when the stain has thoroughly dried, and put on a coat of lackluster or an equivalent.